The holiday season means it’s cold outside and everyone is spending more time indoors, with the windows and doors closed. It’s time to feature beautiful natural scents to highlight the festive spirit. 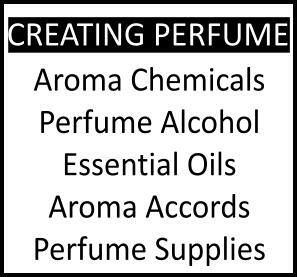 The Natural Perfumers Guild members are dedicated to using 100% natural aromatics, and for this season, members of the Natural Perfumers Guild created ambient fragrance for the home and office, using incense, candles, room sprays and wax melts. Eight Guild perfumers and associates have independently created lovely ambient scent products to celebrate “Home for the Holidays” 2012. The natural scents work hand-in-hand with the idea of fragrant Christmas trees, boughs and wreaths fragrancing the homes and offices. 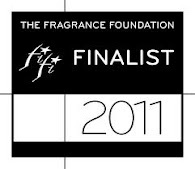 The Guild members were matched up with eight scent bloggers, several of whom have never previously reviewed ambient fragrance products. The rationale behind the idea makes sense, as it's supremely difficult to find natural-sourced products for home use. "We in the Guild thought this was a great challenge, and love the idea of being the first to introduce them to this scenting concept. Many homes are awash with synthetic room scents, from plug-ins to automatic spritzers. How lovely, we thought, to keep in the spirit of the holidays, when pine and cinnamon and frankincense, all natural aromatics, in addition to our creative takes on indoor fragrance, can be introduced!" Bay Rum and Honey - Oh, honey, so yummy - like a tropical night, and surprisingly, a holiday scent, too. Each scent variation is available in 6-8 pieces 3oz. hand-poured and costs 30$. I was sent sample wax melts to try, presented in a lovely purple pouch, obviously hand-poured with love into cookie and candy "molds" that resemble fleur de lys (or small platypus feet, it all depends on your level of humor!) and as soon as I opened the sachet I was greeted by a delicious waft of assorted freshness and spiciness. They're all good, but my favorite has to be Bay Rum and Honey. It has that aromatic spiciness with that clove-like tinge which I adore. The throw is very good and it avoids that pitfall that many "sensual" scents get trapped into: too much sweetness to the point of nausea (though it is sweet, but in a good way). If you're bringing this to the bedroom or the living-room while entertaining you won't have people thinking some random cable melted or that you forgot something sweet on the stove! It also has an outdoorsy nuance that is not common for this genre, Christmas-y, like pine or fir. It smells delicious! Lemon Vetiver emphasizes the fresher, brighter and vivid aspects common on both materials. These two also have other, differently nuanced facets, aromatic for lemon myrtle (which should not be confused with either lemon the citrus or with myrtle, it is backhousia citriodora and it's technically a spice) and licorice for vetiver, which are not explored here. The Lemon Vetiver wax melts would be very popular for de-stuffying a room naturally, sort of actually opening the window; it's a head-clearing, alert scent that would go down very well for a working environment or a home office, it seems to bring on a dynamism and energy to it. Wax melts are a great value since they're also the ultimate recycleable fragrance product (you can stash the cooled melts in a closet or -as Anya suggests, but I haven't tried it personally- use as a polish on furniture). Anya's Garden has offered us the option of a giveaway: To USA-based readers only, a Room Candy tin of the scent of their choice, plus a tea candle burner, a $40 value. 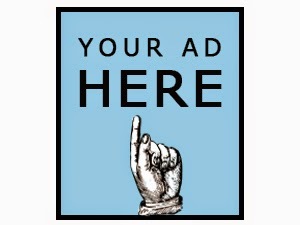 Enter a comment, saying what are you desires/concerns regarding home fragrance and you are eligible. Draw remains open till Sunday 4th midnight. Products reviewed available at Anya's Garden site. There is a good value for money Starter Kit at 40$ which includes a 3oz. 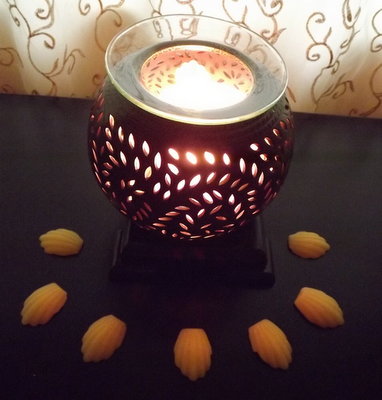 tin of wax melts, tea light burner (not sold separately) and one organic beeswax tea light. Like mentioned above this is part of a greater project including natural perfumers (from Andrea Shanti to Elisa Pearlstine and Anita Casamento) and bloggers (for instance The passionate parfumista, Feminine Things and Perfume Critic) , so if you are really interested you can consult Anya McCoy's blog page for reference and to see other links. My desires for home fragrance..to have as many as possible. Bay Rum and Honey sounds divine! What a nice opportunity, thanks! My little house is very old and full of dust & furnace smell in the winter ( we really need to get the ducts cleaned). I dislike those synthetic grocery store options because they add to the indoor air pollution. The Outlaw scent that I got to smell a sample of is so good and would smell nice in my house. Bay Rum & Honey sounds wonderful. I like candles but really dislike those plug in things for home fragrance. These sound lovely and not so artificial and toxic. Thanks for the draw. Definitely like the idea of the Bay Rum and Honey. Love honey and have always been a fan of Bay Rum. I have been trying to find a nice Bay Rum cologne or aftershave for my hubby. Any recommendations? Please enter me in the drawing! I love being able to alter the mood in a room with fragrance -- so important with the often-gloomy winter months nearly here! My desire, regarding home fragrance, is to create a mood, or healing atmosphere, without using chemicals that can contribute to major health issues. As a society, we pollute our bodies with terrible chemicals from various home and beauty products, then wonder how we ended up with serious and chronic diseases. Thank you, Anya, for providing a better alternative. I vote for natural scent! 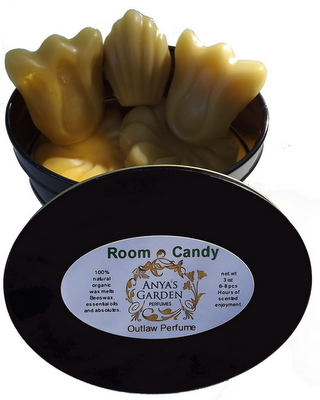 If I am selected I would choose "Outlaw"
Anya's natural perfumes are wonderful. I won Royal Lotus in a drawing and got Moon Dancer and Star Gazer samples as well. I will tell you that her fragrances last for hours and Royal Lotus reminds me of juices of the past. What say you Elena? Please enter me in the draw. I like a little scent around the house, but I don't like the foodie smells. Being a Californian I like lemon vetiver even if I don 't how to spell it! Bay Rum and Honey for me! ooo, Anya...Room Candy...what a great name...I can almost smell that Bay Rum and Honey...Please include me in your giveaway. I am a follower! I love scented candles and incense for the home. And I am wild about the philosophy, if you will, behind Anya's 'Outlaw' scent! Go Anya! I would love to try this, and it seems like a great value. The Bay Rum and Honey one sounds especially enticing. I'm a sucker for any honey scent. What a wonderful idea! Room Candy! Using natural ingredients and aromatics to scent a room. In home fragrance, I'm looking for something that smells amazing and natural, not too intrusive ... but I would like to NOTICE the scent, not have to actually walk up to it and sniff it to enjoy it. I am also looking for reasonably priced options, because I find that when I have a highly expensive candle (for example) I don't use it all the times I would like to, because it represents such an investment. Therefore I will actually use affordable home fragrance much more frequently ... meaning that I actually enjoy it more! I would also like a scent to be on the more natural side, as some of these harsh synthetics I smell just make me feel like I'm inhaling fumes. I think I am eligible because though I am not technically in the US right now, I will be there within 1 month, and have a US shipping address. I enjoy home fragrence that does not compete with our food/cooking. Lemon Vetiver sounds like it would work in our foodie household. I love home fragrance, period. But I find the idea of a true chypre scent for the home really most exciting.